London Central Mosque. Credit: Shutterstock. 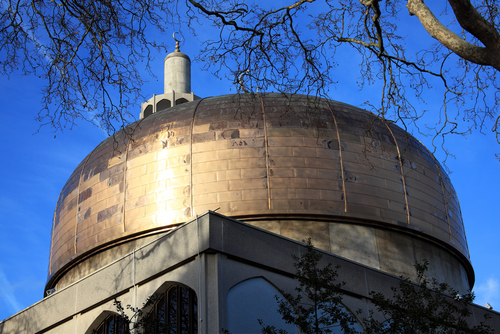 The government has granted protected status to two London mosques on the advice of Heritage England, in recognition of their historic, architectural and cultural importance. Two other mosques, in Bradford and Liverpool, have also been recognised for their cultural significance. 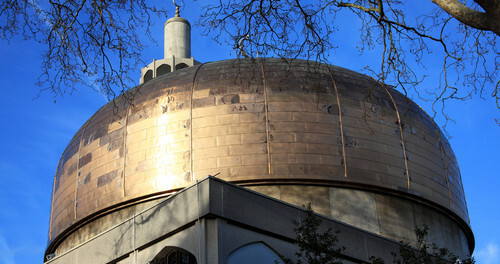 The London Central Mosque and Islamic Cultural Centre in Regent’s Park, built in the 1970s, is now a Grade II* listed building. Just 5.8 per cent of listed buildings are Grade II*, according to Heritage England, which denotes the sheer importance of such buildings. Sir Frederick Gibberd did not begin construction on the mosque until 1974, a year after being selected in an international competition, and took two years to finish. London’s first purpose-built mosque, inaugurated in 1926, now has Grade II status and is today the headquarters of the Ahmadiyya community. Some six-hundred people, including foreign dignitaries, attended its grand opening, with British Pathé capturing the event on camera. Political support helped assuage public hostility for the project. And it served a distinct political function in the interwar years. In 1936, Lloyd George gave a lecture on “Islam in the British Empire” to dignitaries and scholars. This soft propaganda effort was a direct response to postcolonial movements across Europe. Some Ahmadi literature had also expressed support for the British Raj, though it did offer criticism from time to time. The Shah Jahan Mosque, built in 1889, now has Grade I status, which affords it the same standing as buildings like Brighton Pavilion and Buckingham Palace, according to Heritage England. The Shah Jahan Mosque in Woking was built in 1889 and is the country’s earliest purpose-built mosque. The British Orientalist Dr Gottlieb Wilhelm Leitner, a Jewish academic, who founded Woking’s Oriental Institute helped establish this mosque. It fell into disrepair following his death in 1899. A chance visit in 1912 by the eminent solicitor and Islamic scholar Khwaja Kamal-ud-Din, forever changed the fortunes of the mosque. A graduate of the Forman Christian College in Lahore, he was inspired by the writings of the founder of the Ahmadiyya movement. Having gained control of the mosque, he created The Islamic Review, a journal which ran until 1967, and challenged many misconceptions of Islam in Britain. The first registered mosque in England, opened by prominent convert Abdullah Quilliam in 1889, in Liverpool, now has Grade II* status. Its early expansion meant that local Muslims had access to a library, a printing press, a museum, schools for boys and girls, a hostel and a literary society. It served their everyday needs. His writings and lectures on Islam gave him international recognition. The Howard Street Mosque is the first mosque in Bradford, and while it retains its Grade II status, its updated listing reflects its importance of converting a domestic dwelling into a place of worship. A new book, published by Heritage England and authored by Shahed Saleem, documents the history of Islamic architecture in Britain. Of the 1,500 or so mosques in Britain, less than a fifth are purpose-built, as a majority come from converted houses or converted buildings.